There's no evidence that Charlotte Brontë ever visited the John Soane Museum during her sightseeing trips around London. But curator and author Charlotte Cory thinks she should have done. 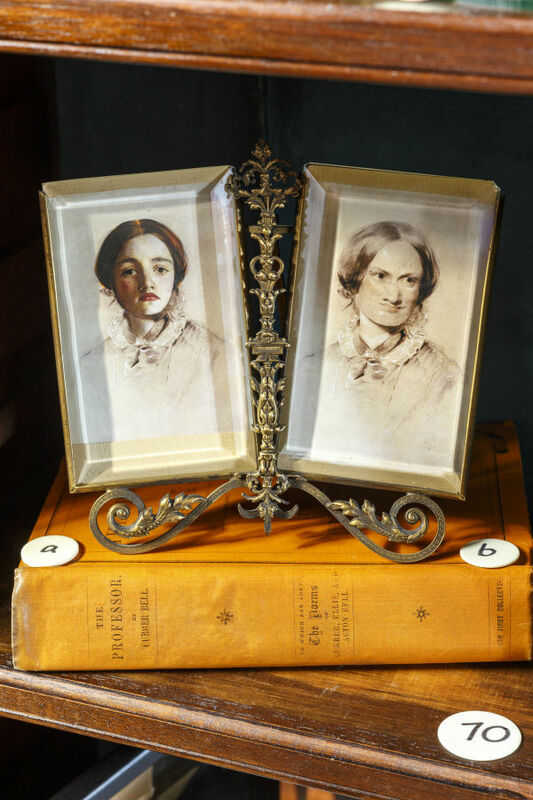 That's the conceit for this new exhibition at the Soane, marking 200 years since Brontë's birth. 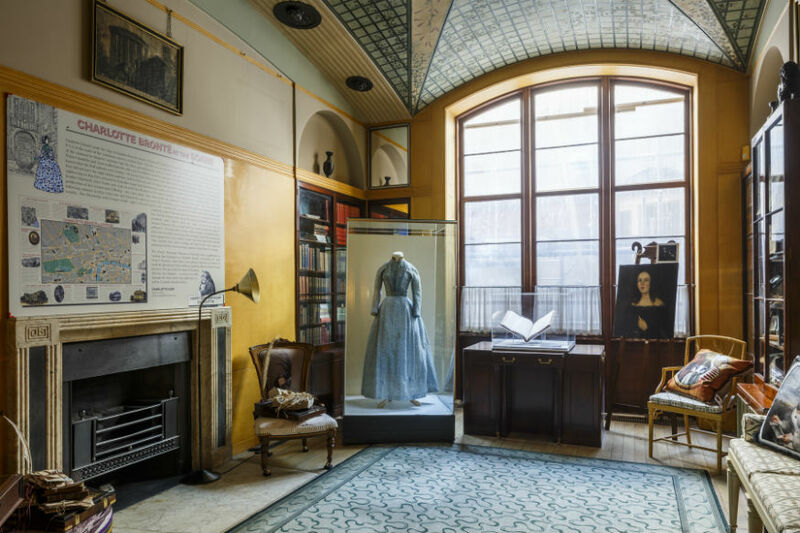 The Soane Museum features in Charlotte Brontë's London guidebook, which is on display here. Because of the Soane's unique status (preserved by an Act of Parliament in 1833), little has changed in the museum since the time of Brontë's success with Jane Eyre in 1848. Stepping into this exhibition is possibly quite like seeing the Soane as Charlotte would have seen it. This idiosyncratic one-room show is as packed full of ideas as the objects that crowd the room itself. 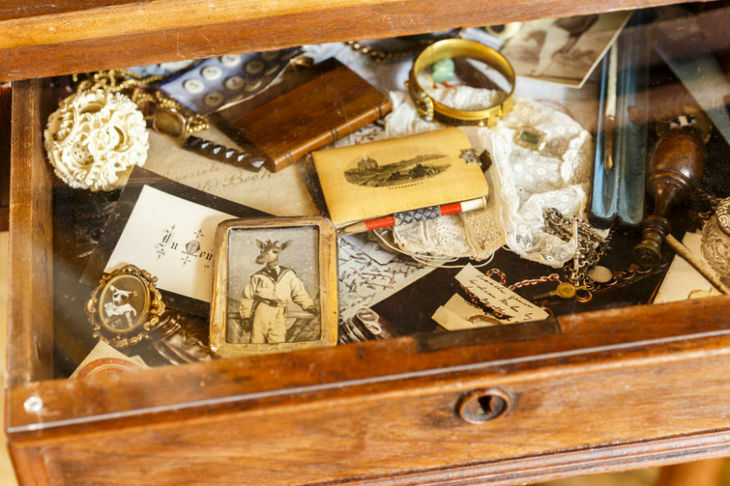 A curate's desk, stuffed full of artefacts and relics that 'could' have a connection to the Brontës. 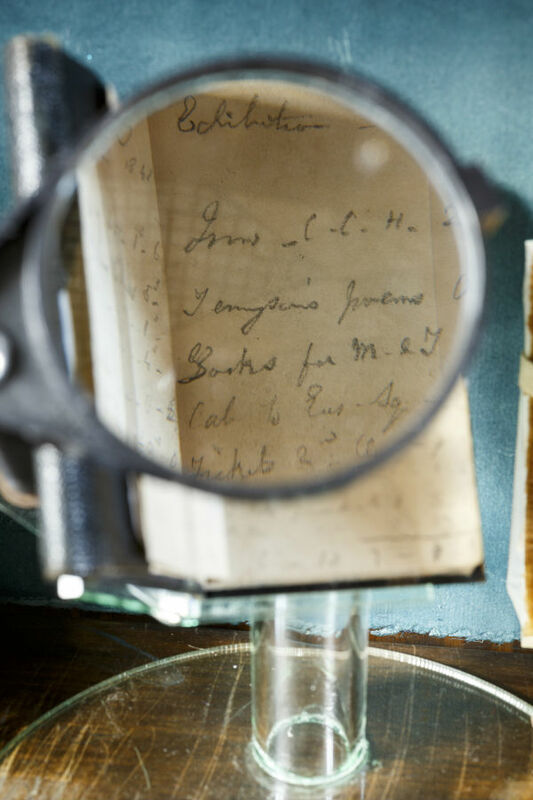 There are treasures on display on loan from the Brontë Parsonage Museum: the dress Charlotte wore to a dinner party at Thackeray's house, as well as an 1838 guidebook from London Zoo, and Charlotte's tiny account book, where she recorded her expenses during her first trip to London. Charlotte Brontë's notebook where she recorded her expenses during her first trip to London in July 1848. Comparisons are made between Charlotte's plain (food-stained?) 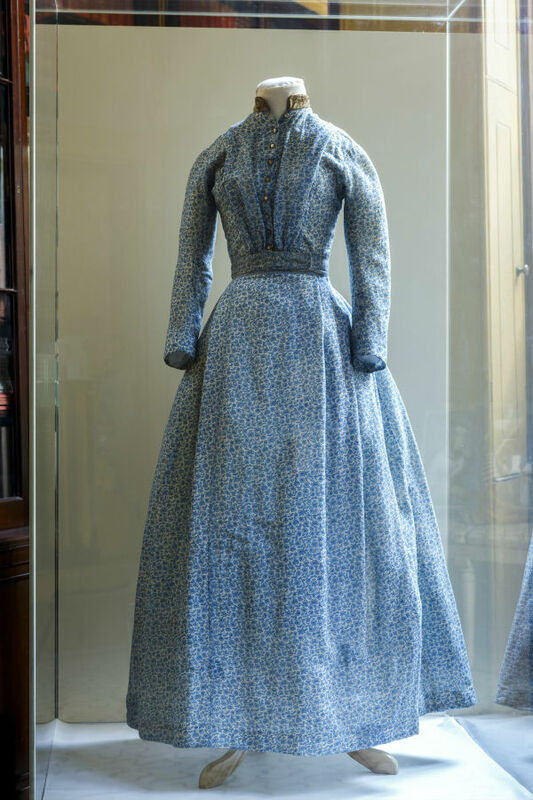 dress and the fashions of the time, with a fashionplate from 1850. Charlotte's trips to the Great Exhibition in Hyde Park in the company of Dr David Brewster are represented by a Brewsterscope, a contemporary instrument for viewing 3D photography. You can also see variations on the George Richmond portrait of Charlotte Brontë: friends claimed the sketch didn't reflect the true likeness, it made her more beautiful. Cory has created an altered version of the picture with a larger nose and chin, perhaps creating a more realistic portrait of the author. Variations on the George Richmond portrait of Charlotte, as imagined by curator Charlotte Cory. Then curator Charlotte Cory abandons the authentic, and heads down an altogether more fanciful road. There's an empty wine bottle — which someone might've swiped from the table as a souvenir of the night they 'dined with Jane Eyre'; Charlotte Brontë reimagined as a thin-faced dog; her friend Mrs Gaskell is imprinted on a chair by the fire as a bird, or 'sharp beaked biographer'. Whimsy overload? 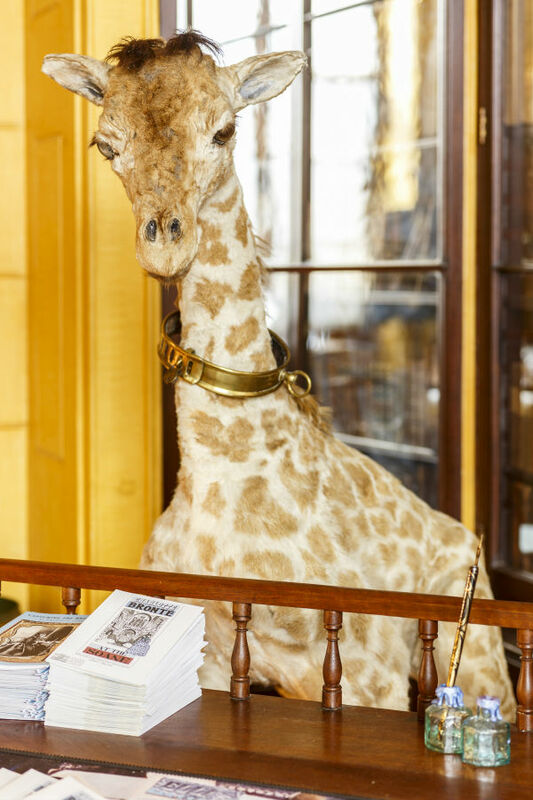 This young giraffe represents the 'young George Smith who stuck his neck out and published a novel by an unknown writer'. If you're a stickler for historical accuracy and have unbending views about the authenticity of artefacts, this might not be the Brontë exhibition for you. But if you enjoy wit and whimsy, and are happy to imagine other worlds belonging to our favourite authors that aren't set down in official historical reports, there's plenty to both inform and inspire at this show. It's both affectionate and irreverent; fanciful and full of important detail. We rather liked it.